Most Items On This Site Are The Exclusive Property Of ADO13.COM And May Not Be Used In Any Form Without Prior Permission Unless Otherwise Stated. Items That Do Not Belong To ADO13.COM Are Used With Permission. 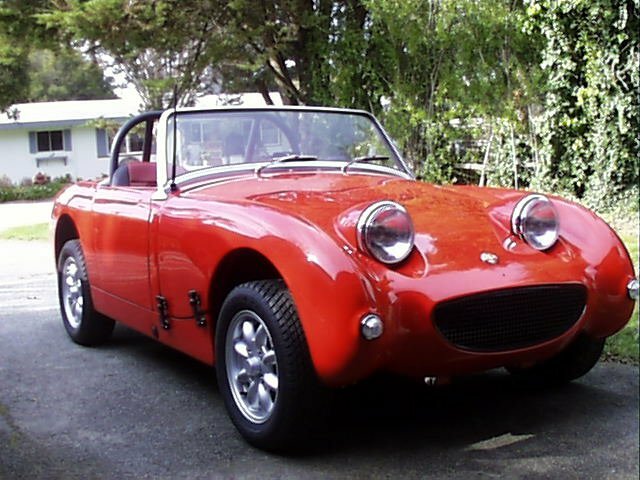 In 1956, Leonard Lord of British Motor Corporation mentioned to Donald Healey that there was a need for a small, low-cost sports car to fill the gap left by the disappearance of the pre-war Austin Seven Nippy and Ulster models. DMH set about designing a prototype which was to become the famous "Bugeye Sprite". This picture is a photograph of a copy of the original scale drawing of the Bugeye Sprite done by Gerry Coker in 1956. The original was reduced to 11 x 17 and the body hand colored by Mr. Coker. The selected color was Ferrari Red. The reason Ferrari Red was chosen was that DMH and Mr. Coker used to joke about the Sprite being the "Poor Man's Ferrari" and according to Mr. Coker, the first Sprite prototype was painted Ferrari Red. Mr. Coker donated this work to the Austin Healey club to be sold at auction at the Lake Tahoe International Austin Healey gathering in June of 2002. I was lucky enough to have purchased it at that time. The Sprite went into production in early 1958 under the Austin-Healey badge as Austin Drawing Office Project Number 13 (hence the site name ADO13) and was an instant success. 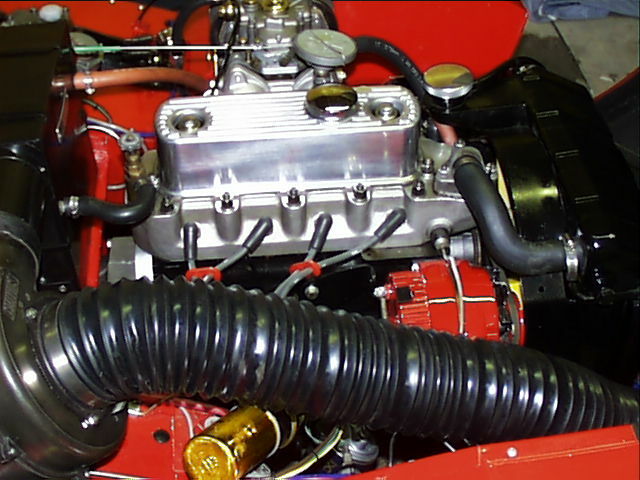 In the original Gerry Coker design (see above drawing and photo below), the Sprite was to have pop-up headlamps that lay flat when closed as later seen on the Porsche 928. They were deleted due to cost and complexity and the headlamps were mounted on the bonnet giving the car a Frog like appearance. The Sprite was immediately dubbed the "Frogeye" which was translated into "Bugeye" on this side of the pond. The "Bugeye" was built from 1958 through 1960 at which time it was replaced by the MkII Sprite and the MkI Midget. All told, almost 50,000 Bugeye's, including those assembled from CKD kits were built. The Italian Sprites were also built on the Bugeye chassis but with a different body. In addition to the 50,000 or so Bugeyes about 75,000 square body Sprites and 225,000 MG Midgets were produced between 1958 and 1979. With about 350,00 cars produced you can understand why most parts are available for these cars, both new and used. Under the skin all Sprites are basically the same and most parts are interchangeable. This also applies to the MG Midget through 1974. 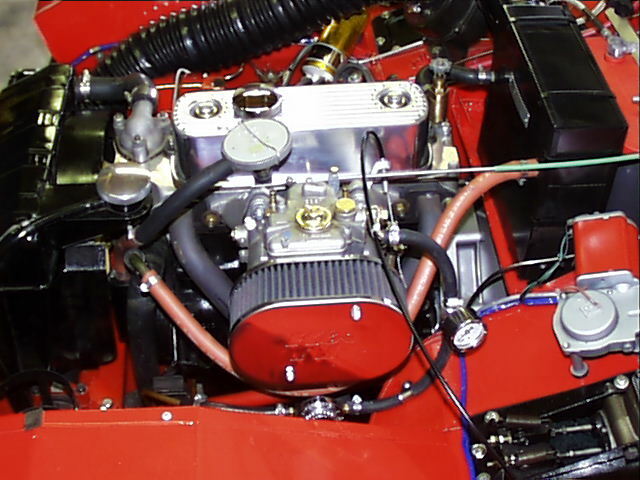 In 1975 the Midget switched to the Triumph 1500 engine and transmission but other than that they are still the same basic car. More information on these cars can be found in this list of publications. These publications are listed in no particular order of importance. Most of the book titles were provided by Frank Clarici of the Spridget list. I think Frank actually owns all of the books listed. Photo and Information Provided by Jonathan Whitehouse-Bird Via Mike Maclean. 7) and Short Windscreen Pillars. 1275 cc "A" Series Engine Bored 40 Over. Aluminum Head & Roller Rockers From Pierce Manifolds. Weber 40 DCOE Sidedraft With Canon Manifold. MSD-6AL Ignition Triggered By Pertronix Ignitor. 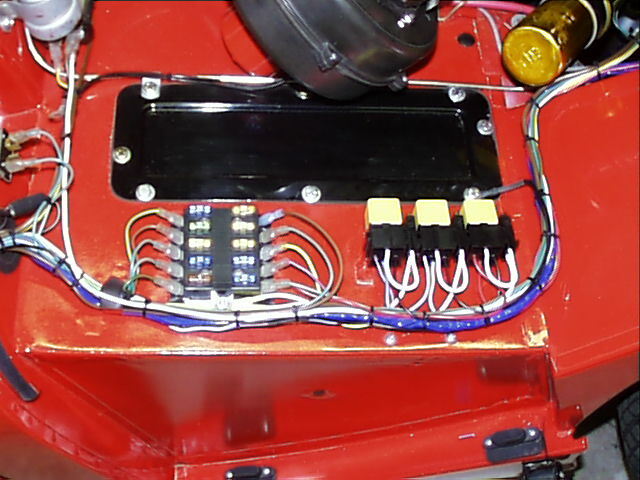 MSD-8680 Cockpit Timing Control (15 Degrees). Plate, 210 Pressure Plate, And 210 Release bearing. Frontline Front Tube Shock & Upper "A" Arm Conversion. 13 x 5" Minitor Mag Wheels. 175 x 60 x 13 Falken Tires. Fiberglass Bonnet With Forward Tilt Hinge. RCI Low Back Fiberglass Seats. Seat Covers By: Andy And Me, Seaside CA. Paint By: Mike At Pestanas, Seaside CA. Carpets By: Ricks Auto Upholstery, Sand City CA. Then search on "BusterCluster 2006"
That I've Owned Since 1966. Using a Tub And Some Parts Catalogs. Building a Bugeye From Scratch. [Advance 5 Sites] [List Sites] Want to join the Spridget Cars Ring?